With connections come opportunities. Connections can lead to mentors, new clients, speaking engagements, publications, and collaborations. But how do you meet people and intentionally build connections? Michael Roderick is a relationship designer, a master connector. 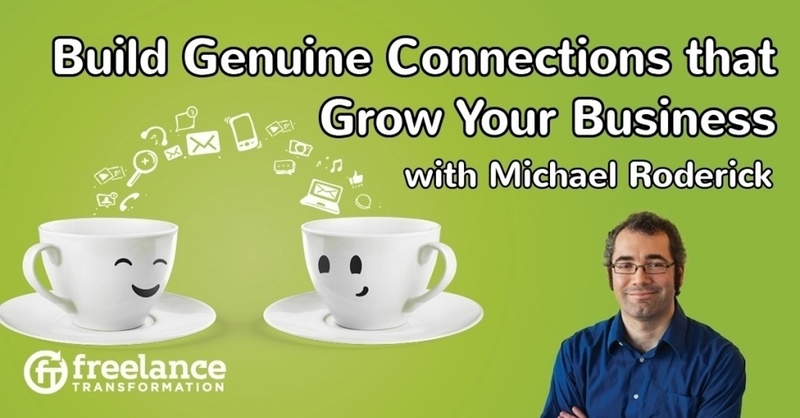 In this episode Michael shares how you can build your own connections, why connections are so important, who to connect with, and how to maintain these valuable relationships. Your connections become your personal super hero team that helps push your business forward. You want the best connections you can so if you have a problem, you know exactly who to talk to to find the solution. A diversity of connections also gives you insight about your ideas and business that you may never have thought of. Having these connections transforms you from a service provider into a resource. A service provider does one or two things well, but the client can always find someone who can do that thing cheaper. A resource also provides a service, but, in addition, is able to link the client to complimentary services that will also help the client's business. People go to resources asking “do you know somebody who does...” and the resource stays top of their mind and will increase the amount of referrals the resource receives. But you can't just sit back and wait for work to come in while being a resource to your clients. This can make you connections rich, but cash poor. Instead, you have to be intentional. Tell your connections how they can help you. If you have referred business to them, then they are waiting for a chance to help you back, but how can they if all they know is that you are a web designer. What are you looking for, specifically? Example of hyper-specificity: I'm looking for authors who are developing new projects and are frustrated that they are spending obscene amounts of money on building a website and are looking for a solution that is in the $5,000-$10,000 range. And right now, I can take on 3 more clients. My goal is to meet 3 more clients this month. Do you have any ideas on who I could speak to or best channels where I can meet these authors? You can have everything in life that you want, if you will just help other people get what they want. Connecting with people is about helping other people. But you can't just ask them, “How can I help you?” When you do that, it makes it seem that you don't consider your work to be very valuable and you put the other person on the spot. You need to talk to them first and offer them something specific. Quick example: The person you are talking to says that they are frustrated with the amount of contacts coming in and they can't keep track of everyone. You mention the name of a CRM and can put them in touch with the founder or send them a link, if it would be helpful. “If it would be helpful” is a useful phrase that lets you see if their problem is important to them and if it is something they would appreciate from you. Now, you've built a connection. You would always be on the look out for people who are slightly ahead of you so you can get an idea of the next step. Slightly ahead could mean that they have been in the business a few years longer than you, make a bit more, or charge a bit more than you. These people are hungry and actively growing their business. They see that helping you will help them back and are therefore open to collaborative opportunities. The big names may see helping you more as a favor because you don't have much to offer them, well not yet at least. Here's a trick: Go to the website of your favorite big name in your industry, someone you admire. Then go to their testimonials page. You will probably find a lot of testimonials talking about how that big name changed their business and helped them out. The people who gave testimonials are the people you want to connect with because they are closer to your situation. But don't just send an email without doing your research. While you check out their websites and google them, ask yourself whether you really care about their ideas and philosophy. If you disagree substantially or something about them grinds the wrong way with you, then don't contact them. Connections should be genuine and forcing connections and pretending that you like the other person will only backfire later. When you've done your research, it's time to contact them. You should reach out based on the ideas you are interested in, the things you are curious about. The first contact should be short. Ask a question to start a conversation, but don't write a 500 word email. Long emails will get you set aside until they have time to address it, which really means it might never be read. The other type of person your should be on the look out for, and should maybe strive to become, is a connector. A connector is someone who constantly sees the world through the other person't eyes and listens for what other people are looking for. Then thinking who is at a higher level that can make that person's life better, or who is at a lower level and could use a mentor. A connector constantly threads people together. You might meet connectors randomly throughout your life. Learn to recognize them by how they help you and others. Connectors are often friend with other connectors so it can substantially expand your contacts by meeting just one connector. Connectors are often people who have gone down multiple career paths and know people in many different industries. Don't be a networker. Networkers focus on their own gain and constantly introduce you for the sake of looking good and to fill a quota. They don't really want to help you and often their connections are in the same or lower level as them. Not helpful for anyone. Once you set up a meeting with someone, it is important to understand that person's conversation style. You need to match their conversation style so you don't cause friction. First, there is the Grandpa or Grandma. They love to tell stories and will give you lots of insight. But, you will have to listen to the stories before you can get down to business. If you go in with the mindset of listening, then you won't have a problem. Then there are the “Let's get this over with” people. They want you to be as direct and quick as possible. They want you to ask your questions right away so they can answer and move on. They are often very busy and may not make the best mentors. With busy, highly influential people, invite them to things where they can leverage their time and meet with a lot of different people. They are more likely to come to a dinner or a gathering. And then there is the friend next door, the buddy. They are very warm and open. You will find yourself having great conversations about business and often everything else. They are also often great connectors. It can be useful to use a CRM to manage all the relationships, such as Contactually which Michael uses. You can also set up your own spreadsheet with names, contact info, and bios. Keep the bios up to date to make it easier for you to connect different people. Michael has two lists: a priority list and an acquaintance list. The priority list contains people he want to consistently stay in touch with. The acquaintance list contains names of people he has only met once, but will contact if something relevant to them comes up. Once you have your lists, you have to intentionally keep up with contacting them, but only in meaningful ways. Don't spam! Pay attention to what they are up to, twitter is great for this! And if you notice that they showed up on a podcast, wrote an article, or have done something interesting, send them a quick compliment. You can even write “no need to respond” if you know that they are really busy. You can also invite them to something, ask to interview them, ask them to write a guest post, or be creative. But, again, don't spam. And keep it short. Michael is offering an online course, The Connector's Path, that starts September 19. The course walks through the challenges that people have becoming connectors, from the psychology that makes reaching out to people difficult, how to activate your network, and how to let people know how to help you. Limited enrollment so go check it out. Special offer for FT listeners: If you email Michael and mention that you heard him on FT and want to take the course, then you also get a 30 min talk directly with Michael!